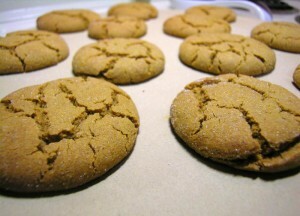 Nothing smells better during the Holidays then ginger cookies baking in the oven. These cookies deliver big on flavor due to the type of sugar – Dark Muscovado. This sugar is partially unrefined evaporated cane sugar and has a strong molasses flavor so it give the cookies a deep gingerbread taste. Dark Muscovado can be found at Fresh Market in Louisville but can be substituted with dark brown sugar if unavailable. Place the raisins and rum in a sauce pan on the stove top and over medium heat to a simmer. Remove from the heat and set aside so the raisins can soak up the rum for about 15 minutes. Drain off the remaining rum. In a large bowl sift the flour, baking soda, cinnamon, cloves, nutmeg, ginger and salt together. In the bowl of an electric mixer beat the dark muscovado sugar, oil and molasses on medium for about 5 minutes. Add the egg and beat for another minute. Scrape the bowl, beat again for another minute and turn the mixer to low. Add the dry ingredients slowly, then increase the speed to medium ad mix until everything is well combined about 2 minutes. Stir in the crystallized ginger and the rum soaked raisins. Place in the refrigerator and chill for 24-36 hours. Heat the oven to 350 degrees. Scoop the dough into a 1-1/2 inch balls and roll in turbinado sugar. Place on the parchment covered baking sheet about 3 inches apart and bake for 13-15 minutes. Cool on the cookie sheet for a couple of minutes and then cool completely on a rack. Store in an air tight container. Happy Holidays from Fresh Chef Experience!